Added by Indo American News on February 6, 2015. To celebrate India’s 66th Republic Day, Consul General P. Harish and Nandita Parvathaneni hosted a Republic Day Reception on 26 January. The Honorable Mayor Annise D. Parker, City of Houston; First Lady Kathy Hubbard, The Honorable Harris County Judge Ed Emmett attended the Reception with over 350 invited guests. 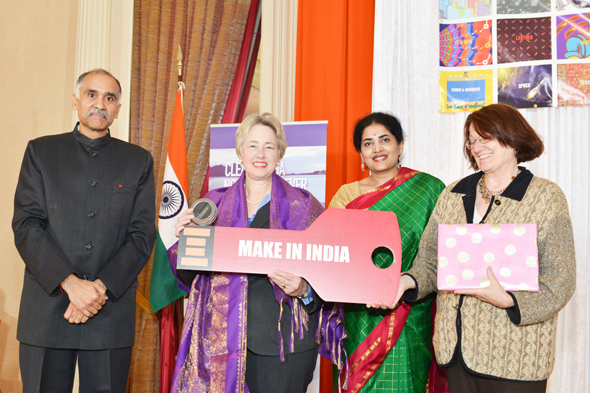 In photo, Consul General presenting a key shaped flash drive with MAKE IN INDIA logo containing all digital information of the Make in India campaign. HOUSTON: The early morning chill couldn’t dampen the enthusiasm of the many who came to the Indian Consul General’s home for the traditional flag hoisting and reading of the Indian President Pranab Mukherjee’s address to the nation to honor India’s Republic Day. 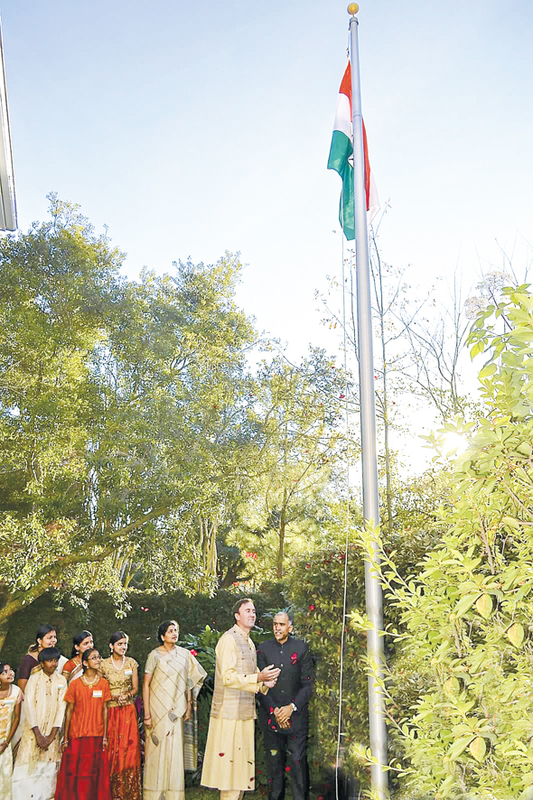 Despite it being a workday Monday, a crowd of people – and some children who skipped school to perform – attended the unfurling of the Indian Tricolor in a tradition that has become widely anticipated by the community ever since the Consul General moved to his residence off Chimney Rock and Woodway. Udipi Café catered the morning snacks as well as the evening dinner and owner Satish Rao was visible making sure things went off smoothly. Chief among the guests was Republican Congressman Pete Olson (TX, 22nd Dist) who made it a point to attend despite having to rush to the airport to catch a flight back to Washington DC for the session of Congress. It was a gesture of his growing admiration of India’s achievements and personal relation with Consul General Parvathaneni Harish and the local Indian community as a whole that made Olson make the brief stop and make some remarks on the occasion. 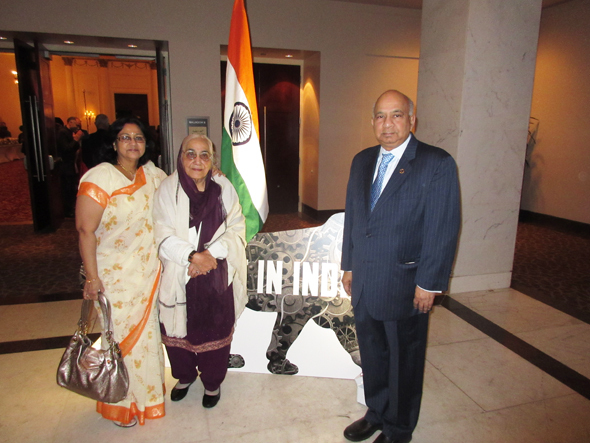 To celebrate India’s 66th Republic Day, Flag Hoisting and Open House for Indian nationals and friends of India was held on January 26, 2015 at the residence of P. Harish, Consul General of India, Houston. In photo, unfurling of National Flag by Consul General at his residence and next to him is Congressman Pete Olson. Olson has been a steady featured guest at many Indian functions, especially in Ft. Bend County where his office is located. He recently completed an official trip to India and came back with favorable impressions, which he recollected for the audience which crowded the main living room, foyer and outdoor patio of the CG’s residence. Olson lauded the growing warm relations between India and the US, as demonstrated by expansion in bilateral trade and culminating in the export of LNG to India, anticipated to start in 2016. Harish was deeply involved in pursuing deal in the final months leading upto Congressional approval, when he first arrived to take up his post in 2012. Olson went on to commend Harish for building friendly relations between India, Houston and America “which is exciting and special”. Harish presented Olson with a shawl and in return, Olson presented Harish with a framed picture of himself presenting a cowboy hat to Prime Minister Narender Modi during his trip to India. Students from Anjali Center for Performing Arts at the Reception. Again by recent tradition, later that day, in the evening the Indian Consulate held its Republic Day reception to an invited list of over 250 guests at the Hilton Post Oak with speeches and a short entertainment program featuring local talent of students of the Anjali School of Performing Arts, whose Director Ratna Kumar was on hand and a musical performance by Pt. Suman Ghosh. The emphasis this year was on the Make in India drive that the new Prime Minister has initiated and hopes to make a rallying cry to entice foreign investment into the country. 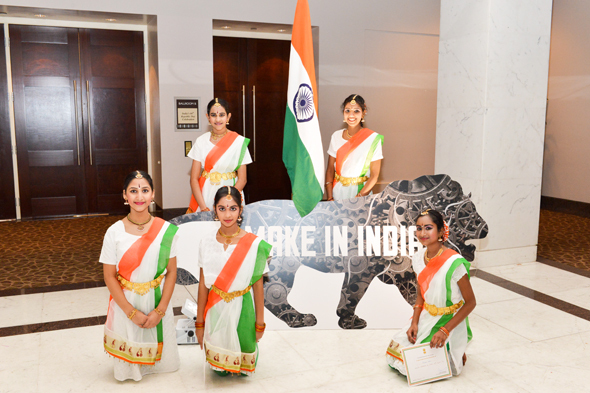 A cardboard cutout featuring a the silhouette of a lion with the logo emblazoned on it and an Indian tricolor were placed at the entrance to the ballroom and another tall display with digital graphic features showing India’s potential in manufacturing was prominent on one side of the vast space. Tall display banners of the PM’s other initiative, the Namami Gange (Integrated Ganga) Conservation Mission were prominent on the stage to bring attention to the movement to clean the holy river through a six-point program that, at its heart, stressed personal and corporate commitment. Consul General Harish welcomed the guests on the auspicious day commemorating the adoption of India’s Constitution 66 years ago, and noted that this year’s celebrations were unique due a series of firsts: the first US President to have visited India twice during his tenure; the first US President to be Chief Guest at the Republic Day parade; the first Indian Prime Minister to have been born in free India and also is the first to be elected by a majority in 30 years. Harish introduced Dr. Kamlesh Lulla, a research scientist who has worked at NASA for 30 years and was recognized by the Paravasi Bharatiya Divas Samman (Overseas Indian Day Conference) held in January in New Delhi with an award for his outstanding efforts. After he was draped with an honorary shawl by Harish, a jubilant Lulla spoke about his janam bhoomi (birth place) of India and his karam bhoomi (work place) of the US, crediting both with his success. He spoke about his visit to Porbandar, the birthplace of Mahatma Gandhi, on the birth anniversary of the revered Indian leader, noting that he himself was from nearby Baroda.